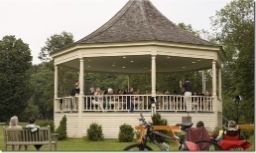 In the summertime in Lexington, there is a band concert every Tuesday night. The Lexington Bicentennial Band plays. They’re very good. Tonight was the first one for this season because the High School ran so late because of the flood in the fall. Tom’s band teacher, Mr Leonard was the conductor. Luckily the weather held out tonight, although it looked a little iffy for a while. It was also colder than I expected, and I wished I had brought a jacket at times. Cook the chicken breasts, shred the meat coarsely. You can saute the chicken or poach it in broth, either way is fine. Meanwhile bring 2 cups of water to a boil. Add the dried couscous, stir to moisten, and remove from the heat. Cover and let stand 5 minutes for the couscous to absorb the water. [I used tricolor couscous for extra color]. Mix the chicken and couscous in a large bowl. Pour the curry dressing (below) over the mixture and set it aside in the fridge to cool. While it’s cooling, chop up the rest of the ingredients other than the pine nuts. If you can toast your pine nuts without getting distracted, by all means do that. It definitely tastes better, but nine times out of ten I end up burning the nuts so now I just use raw pine nuts and it’s fine. Mix the veggies into the couscous mixture. Adjust the salt and pepper to taste. Sprinkle the nuts over the top and serve. Or you can put it back in the fridge to chill, but I would wait to put the nuts on just before you serve it. Mix the juices with the spices. Slowly add the oil while whisking to combine. For desert, we had a special treat. Tom had run down to the North End today with his friend Ben. 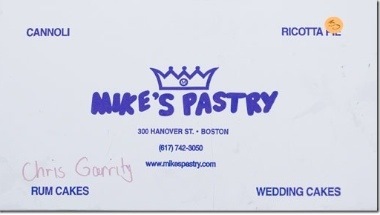 They brought back some treats from Mike’s Pastry.